September 5, 2018 | While broadcast television and the internet offer a wealth of free-to-watch movies, shows and video clips, U.S. consumers aren’t ready to settle if they don’t find something they’re truly interested in. And that means they’re freely opening their wallets for streaming and downloadable content, to subscribe to video services, and to buy physical DVDs and Blu-ray discs. So who’s paying to hit play? And, how do the consumers willing to shell out cash for content differ from those who don’t? 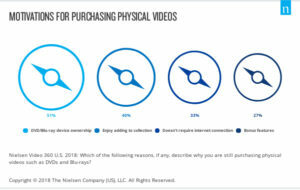 According to Nielsen’s Video 360 report, 51% of people in the U.S. ages 13+ reported buying a physical video in the past year and 42% purchased digital videos. 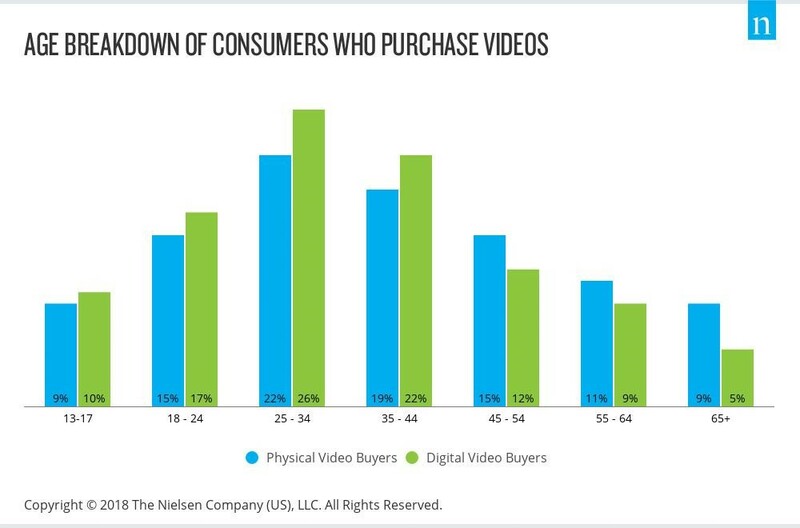 Ages 25-34 are the most likely to pay for both physical and digital videos. To no surprise, device ownership is the biggest reason for buying that DVD or Blu-ray, but adding to physical collections, being able to watch without internet access and the availability of bonus features are also significant purchase drivers. 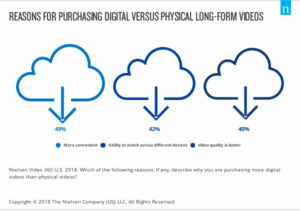 For digital video buyers, convenience is key. And the ability to watch across different devices, like TV, tablets and mobile phones is also a driving factor in spending money on digital content. Some consumers aren’t willing to pay for content when they can get it for free. Cost is the biggest deterrent for physical or digital video purchases, but device ownership and access also weigh into purchase decisions. Looking to the future, full-length video producers may want to use short-form videos to drive purchases, as 62% of those who spent money on full-length videos this year also reported watching more short-form videos. DOWNLOAD THE 2018 NIELSEN VIDEO 360 REPORT HERE.